Japan’s Ryosuke Yamamoto successfully defended his ASTC Triathlon Asian Championship as he held off fellow countryman Hirokatsu Tayama by 24 seconds to take victory in Incheon, South Korea with a time of 1:49:55. 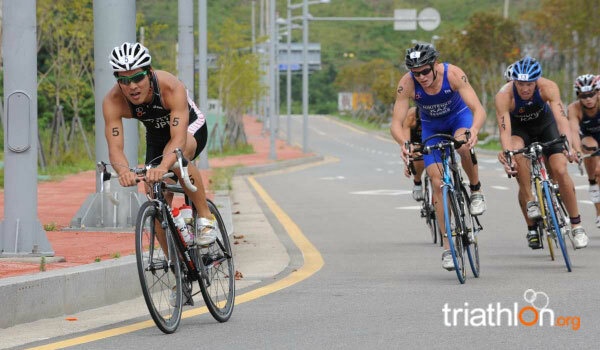 Having swum and biked together, the lead pack of eight, which included three Japanese, two Chinese and two Korean athletes and Daniel Lee Chi Wo from Hong Kong, exited for the run some three minutes clear of their nearest rivals. Yamamoto and Tayama battled ahead as they fought it out for the win with Lee Chi Wo and China’s Zhihang Jiang fighting it out for the bronze. Late on Yamamoto was able to breakaway for the win whilst Jiang and Lee Chi Wo saw out a sprint finish with Jiang given the nod for third despite crossing the line with exactly the same time. As with the men’s race, Japan largely dominated in the women’s competition with the nation taking the top five spots as Tomoko Sakimoto won her first ASTC Triathlon Asian Championships ahead of the experienced Ai Ueda and Akane Tsuchihashi. With the top seven all breaking away after the swim, Japan’s Mariko Adachi, was dropped out of contention. The five Japanese athletes shared the pace with the Korean pairing of Yun-Jung Jang and Dan Bi Hong, but they were unable to keep up on the run. Sakimoto ran away to win in 2:01:28, some 17 seconds ahead of Ueda, who just held off the charging Tsuchihashi by two seconds. The fastest run of the day went to China’s Ting Liu who moved up from the chase pack to take sixth. El japonés Ryosuke Yamamoto revalidó con éxito el Campeonato Asiático de Triatlón ASTC al hacerse con la victoria en un tiempo de 1:49:55 en Incheon, Corea del Sur, 24 segundos por delante de su compatriota Hirokatsu Tayama. Después de ir unidos en la natación y la bicicleta, el grupo de cabeza de 8, en el que había tres japoneses, dos chinos, dos coreanos y Lee Chi Wo de Hong Kong, salió a la carrera a pie con una clara ventaja de tres minutos sobre sus rivales más cercanos. Yamamoto y Tayama se situaron en cabeza y lucharon por la vitoria, mientras que Lee Chi Wo y el chino Zhihang Jiang lucharon por la medalla de bronce. Al final Yamamoto fue capaz de escaparse para conseguir la victoria, mientras que la tercera plaza se decidió en un emocionantísimo sprint final en el que Jiang salió victorioso pese a cruzar la línea de meta en el mismo tiempo. Como en la carrera masculina, Japón dominó con claridad la carrera femenina, logrando las cinco primeras plazas para su país. Tomoko sakimoto ganó su primer Campeonato Asiático de Triatlón ASTC por delante de la experimentada Ai Ueda y de Akane Tsuchihashi. Con las siete favoritas escapadas tras la natación, la japonesa Mariko Adachi se quedó fuera de la lucha. Las cinco atletas japonesas trabajaron junto con la pareja coreana formada por Yun-Jung Jang y Dan Bi Hong, pero fueron incapaces de mantener la fuga en la carrera a pie. Sakimoto se escapó y se hizo con la victoria en un tiempo de 2:01:28, 17 segundos por delante de Ueda, que se impuso por tan sólo dos segundos a Tsuchihashi. La carrera más rápida del día fue para la china Ting Liu quien paso del grupo perseguidor al sexto puesto.